Chinese firms move up the value ladder with international contracts, Wang Zhenghua reports in Shanghai. In one of the most challenging tasks it has ever embarked on, China's biggest heavy machinery maker, Shanghai Zhenhua Heavy Industries Co, wrapped up construction of the final four pieces of fabricated steel for the San Francisco-Oakland Bay Bridge. Zhenhua hopes that its $350 million contract, part of a $6.3 billion reconstruction project, will foster its reputation as a top-notch builder able to meet the most stringent safety and quality specifications. "The erection of the Bay Bridge is a milestone for Zhenhua to diversify into the bridge-building sector," company president Kang Xuezeng said at the completion ceremony on July 11 in Shanghai. "If Zhenhua is able to build the steel section for a US bridge, then we are capable of erecting any bridge in the world." Only one month earlier, another Chinese heavyweight in international engineering projects suffered a major setback in Europe. China Overseas Engineering Group withdrew from a $447 million highway construction project in Poland after incurring heavy losses. The company became the first Chinese enterprise to win a large European highway contract just two years ago. These projects demonstrate that China is moving up the global economic value chain and trying to break into big-league projects in the US and Europe, some experts said, as China aims to become the world's civil engineer. Chinese enterprises have been hired to build rail lines in Venezuela, renovate subway systems in the United States and erect huge apartment complexes in Saudi Arabia - on the reputation of showcase projects such as Beijing's airport terminal and mammoth high-speed railway network. 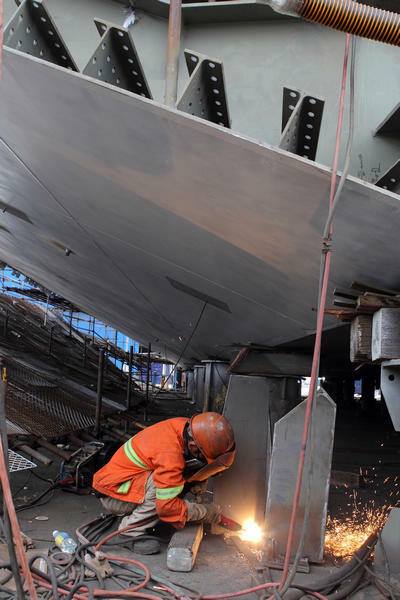 Figures from the Ministry of Commerce indicate that, from 1978 to the end of June, China had clinched overseas engineering contracts worth a total of $765.5 billion. In the past decade, China's overseas engineering revenue grew by an average of 27.1 percent every year, while the value of newly signed contracts climbed an average of 27.6 percent each year. 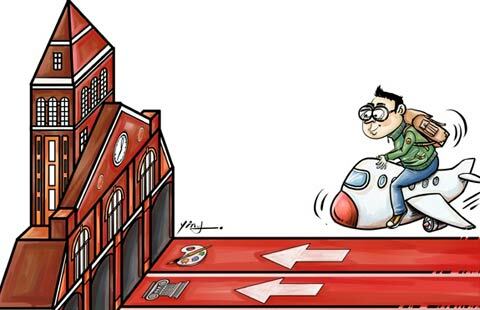 After starting with housing and transportation programs in the initial periods, Chinese overseas engineering firms have diversified into sectors including power and petrochemical industries, water supply and sewage, telecommunication, and metallurgical and mining business. The number of overseas contractors from China has exploded since their first attempts in the late 1970s. 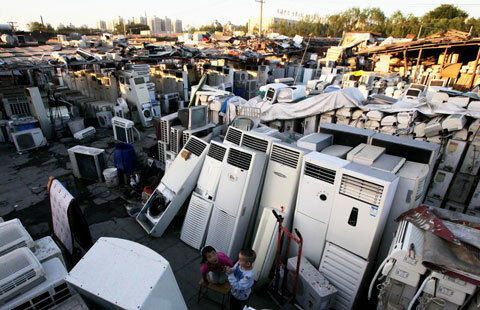 More than 2,000 Chinese enterprises now compete in international markets. 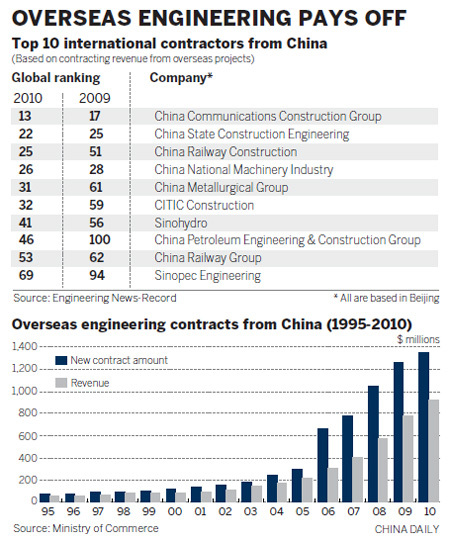 The Top 225 International Contractors list compiled last year by Engineering News-Record magazine included 54 companies from the Chinese mainland, the largest number from any country. They accounted for 13.2 percent - the largest share - of the $383.8 billion in revenue generated by the 225 contractors in 2009 from projects outside their home countries. Executives and officials said the full financial force of the Chinese government behind its infrastructure companies gives those companies an edge that is hard for private industry elsewhere to beat. An example is the Bay Bridge project in California. It includes reconstruction of the eastern span of the bridge, which was heavily damaged in a magnitude 6.9 earthquake in 1989. State-owned Zhenhua was selected, despite its lack of experience in bridge building, because of advantages including its huge steel fabrication facilities and a low-cost work force of roughly 35,000 people. The decision to save some $400 million by outsourcing the fabrication of the main sections of the bridge reflected global realities, especially of the aging American steel industry, said Steve Heminger, executive director of San Francisco's Metropolitan Transportation Commission. The Chinese company also had the ability to make and deliver both the new sections of the bridge and the huge crane needed to lift them into place, he said.